This will be a short post to feature some of my finished products that I totally loved. 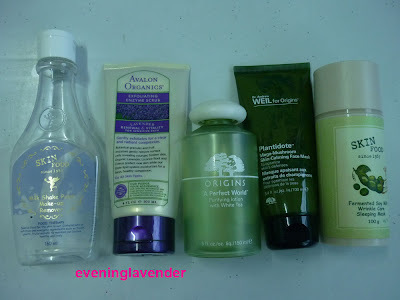 Some products were used up in Dec 2010 & Jan 2011 but I had no mood to post it. Hence, this is a delayed post. You may click on the product names for the detailed review that I posted some time ago while I was still using the products. 1. Skinfood Milk Shake Point Makeup Remover - My favourite so far. Now I am using Shu Uemura Cleansing oil. Therefore, not repurchasing this yet. Do you wanna share your finished products too? Hey! The Skinfood remover seems really good. I've heard it's really mild but takes away makeup easy. It's cute too, looks like milk! Yes, it is among the best eye and lip makeup remover. Comparable with Clinique and Elianto. I still have pending product not finished, some purchase online from forum so dont know the brand name as its powder form of mask.